Cybele and Attys (Museo Archeologico Nazionale di Venezia). In 186 – or a few years later – a badly documented rebellion broke out, usually called the Bellum desertorum. It was led by a deserter from the Roman army, one Maternus. Maternus gathered around him a group of comrades from the army and started to pillage the countryside. At first he was just a local brigand, but with success came wealth, and wealth led to more supporters joining his ranks. Ultimately, Maternus and his men were overrunning most of Gaul and the Iberian provinces, looting and burning the countryside and even attacking large cities. Commodus sent Pescennius Niger against the rebels, who soon realised they were outnumbered. Herodianus relates how Maternus and his followers now slipped into Italy and devised a plot to kill the emperor. The murder was supposed to take place during the annual procession in March in honour of the goddess Magna Mater or Cybele. Maternus and his men were to disguise themselves as praetorian guardsmen, infiltrate the procession and then kill Commodus. The plan was betrayed to Commodus by some of Maternus’ comrades and the rebel leader was arrested and decapitated. The Bellum desertorum can arguably be considered historical (it is mentioned by Herodianus and the Historia Augusta), but whether Maternus really attempted to assassinate Commodus is up for debate. One of the most powerful men of the Empire was the emperor’s cubicularius (chamberlain), a Phrygian freedman named Marcus Aurelius Cleander. His power had been growing especially since the death of Perennis, the praetorian prefect who was executed in 185. Being a praetorian prefect was quite risky. If we are to believe the Historia Augusta, Perennis’ successor was a certain Niger, who held the position for just six hours. Another successor, Marcius Quartus, lasted just a little longer: five days. When yet another praetorian prefect, one Aebutianus, was killed somewhere between 186 and 188, Cleander became a praetorian prefect himself, reportedly one of three, but definitely holding a senior position. The four Circus parties, green, red, blue and white (Museo Nazionale Romano, Rome). In 190, Cleander’s luck ran out. Italy had been struck by a terrible plague this or the previous year. It was possibly smallpox, and it was claiming thousands of lives. A densely populated city like Rome was hit very hard, and both people and animals were dropping like flies; Dio claims as many as 2.000 people died in Rome in a single day. Commodus, on the advice of his physicians, had already left the city and had moved to Laurentum, some 40 kilometres south of Rome. To make things worse, at the same time Rome was struck by a great famine. The people accused Cleander of buying up large quantities of grain, thus preventing the grain from being sold at the markets. It is hard to ascertain whether Cleander was truly guilty. Dio claims that the true culprit was a grain commissioner named Papirius Dionysius, who made the famine worse in the hope that the people would blame Cleander. Which the people did. During horse-races at the Circus Maximus, the people began shouting insults at Cleander. A large crowd subsequently left the city to find the emperor and inform him about what his most trusted advisor was doing. Commodus was apparently unaware about what was going on in the city, and Cleander wanted to keep him blissfully ignorant. When the crowd reached the estate where the emperor was staying, Cleader ordered the imperial horse guards to charge them. Many citizens were cut down by the guards or trampled by the horses. 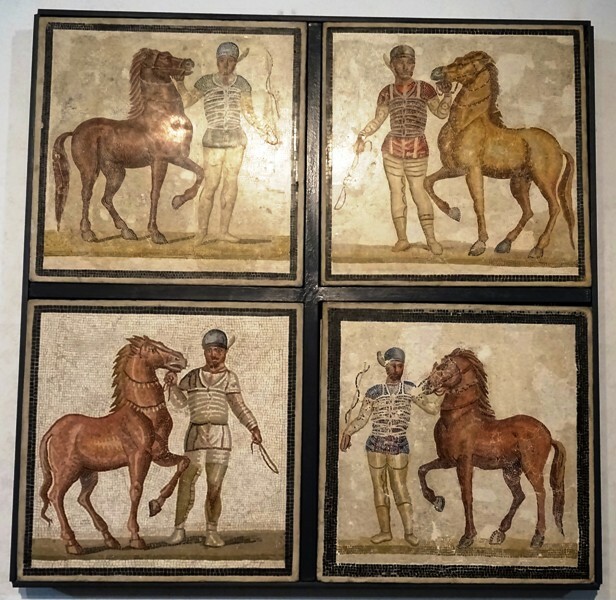 The horse guards chased the crowd back to the gates of Rome, which makes it rather unlikely that Commodus was staying near Laurentum, which – as stated above – is 40 kilometres from Rome. Dio claims Commodus was staying in the “Quintilian suburb”, and this term likely refers to a large estate that was once the property of two fabulously wealthy brothers, Sextus Quintilius Condianus and Sextus Quintilius Valerius Maximus. The brothers had jointly held the consulship for three months in 151, and their sons may have been consuls in 172 and 180. Condianus and Maximus had been murdered in the aftermath of the failed conspiracy against Commodus of 182. There is no evidence that they were ever involved, and it is more than likely that the emperor merely coveted their huge estate. This villa was located on the Via Appia, some eight kilometres outside the Porta Capena, so it was a lot closer to the city than Laurentum. Remains of the Villa of the Quintilii. Now that the chase had reached the city, the citizens began fighting back. The people bolted their doors, climbed on rooftops and began pelting the horse guards with bricks and tiles. Many guardsmen were killed or wounded and many horses slipped and threw their riders. The praefectus urbi Publius Helvius Pertinax also intervened and ordered the urban cohorts (cohortes urbanae) to aid the people. These soldiers had little love for the imperial horse guards and ultimately the latter were forced to retreat and flee. Bust of Pertinax (Vatican Museums). Commodus was now informed of Cleander’s crimes, either by his elder sister Fadilla or by his mistress Marcia. Dio claims that Marcia had originally been the mistress or the “notorious wife” of Quadratus, the same Ummidius Quadratus who had been killed by Commodus for his involvement in a plot to kill the emperor. Dio also mentions “the tradition […] that she greatly favoured the Christians and rendered them many kindnesses”, words that were most likely added by Xiphilinus, the 11th-century Christian scholar who epitomised Dio’s work. In any case, Commodus was now forced to take action against Cleander. He summoned his praetorian prefect and had him arrested and beheaded. Cleander’s head was stuck on a spear and carried through the streets of Rome, much to the delight of the population. The emperor also had Cleander’s children killed, and all those who were known to be his friends. Their bodies were dragged through the streets, mutilated and finally dumped in the sewers. Commodus was still quite popular, and when he returned to Rome, he was greeted by an enthusiastic crowd. – Historia Augusta, Pescennius Niger 3. – Adrian Goldsworthy, The Fall of the West, p. 50-51. Hi – the Quintilian suburbs are, I would imagine, centred on the huge estate formerly belonging to the Quintili brothers were had been executed soon after Commodus took the throne (on a pretext – Commodus coveted the estate and took it for himself). You can see it today by the side of the Appian Way only a short distance from the gate of the city. Hello Anthony, thank you for your interesting suggestion. Cassius Dio indeed mentions the Quintilii brothers in Book 73.5-6 and the Historia Augusta also claims that Commodus had them killed (Commodus 4). So yes, it seems quite possible that they gave their name to the mysterious Quintilian suburb. I assume the gate you are referring to is the Porta San Sebastiano, the former Porta Appia? Where exactly can I find the estate you mention? Is it somewhere in the Parco della Caffarella? Anthony Riches was right. I’ve located the estate, visited it myself and have added some text and a picture.